In this series I show how you can use a cheap close-up filter to take macro pictures. The previous post is a general introduction, and this post will show you how to fix chromatic aberration introduced by the filter. As shown in the previous post, the cheap 8x close-up filter introduces a lot of chromatic aberration (CA), especially at high magnification (45-150mm lens at maximum focal length). This is obvious when taking a picture of a black and white checkered pattern. 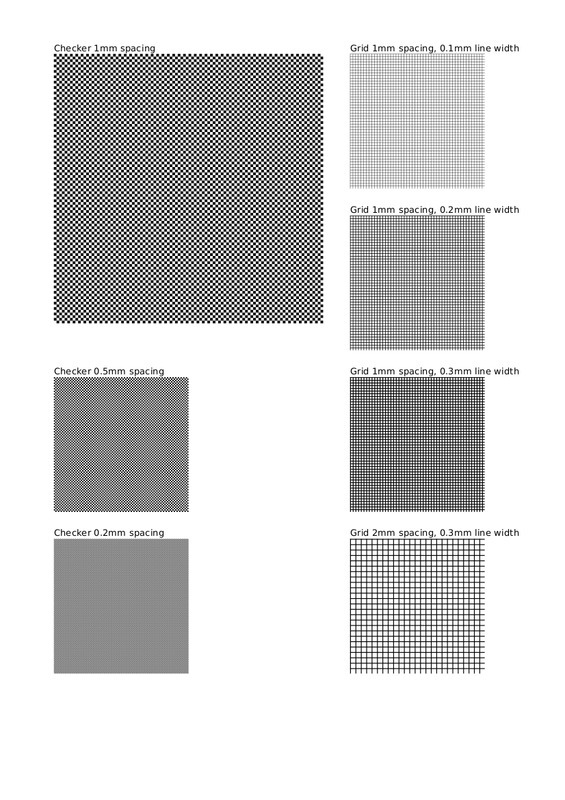 Checkered pattern (1mm square size), uncorrected. Can we fix this? After all, the Micro 4/3 is known to fix lens distortion and CA in software. The idea is that Panasonic could manufacture optically inferior lenses, with fewer elements, hence cheaper/lighter, and fix some of the image imperfection in software. Since there is no viewfinder, the user would never notice these corrections. Here, I'm pushing this to the limit: adding a very cheap close-up adapter, that introduces a lot of CA, and seeing how we can recover a decent-looking image. All these commands are easier to run on Linux. There are ways of doing similar stuff on Windows (cygwin?) and MacOS X, but I won't go into that. I couldn't find a simple test pattern (read: a 2-minute Google search didn't output anything good), so I decided to create one, with checker pattern of 1mm, 0.5mm, 0.2mm, and various grid patterns. I use some Ruby code to generate a SVG file, that can then easily be converted to pdf. The source code to generate the pattern is available on github, and you can download the calibration pattern pdf. Calibration pattern. Download the PDF here. My printer cannot render properly the 0.2mm checker pattern, nor the 0.1mm line width. For the rest, the quality seems quite good. You can stop here if you think those parameters are correct. In my case, I decided to go a bit further, and averaged detected parameters over a number of pictures of the test patterns. As you can see in the following box plot, there is some variability in the parameters, and some clear outliers. For each of the parameters, I chose to use the median of the 12 estimates (the median is less sensitive to outliers than the mean). Box plot of the parameters a, b, c and v, for the red and blue channels. The box indicates 25% and 75% percentile, while the horizontal bar is the 50% percentile (i.e. the median). You can download the code on github (as well as the R script to show the boxplot).